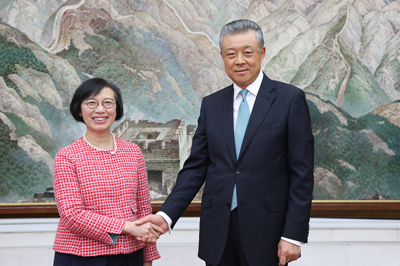 On May 17, Ambassador Liu Xiaoming met with Professor Sophia Chan Siu-chee JP, the visiting Secretary for Food and Health of Hong Kong SAR Government, at the Chinese Embassy. Ambassador Liu noted that the China-UK "Golden Era" is accelerating with increasing political trust, fruitful outcomes in pragmatic cooperation and ever-closer people-to-people and cultural exchanges between the two countries. 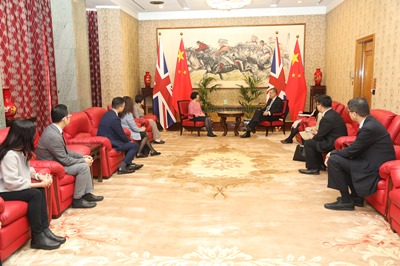 As an important part of China-UK high level people-to-people exchange mechanism, the cooperation on health care has enriched China-UK relations. The Ambassador stressed that, since its return to China, Hong Kong has been forging ahead to notch up remarkable achievements, playing an important role as a bridge and a bond for China-UK relations. Last year, President Xi Jinping visited Hong Kong and delivered an important speech, which charted the course for Hong Kong's development in the future. At Boao Forum for Asia Annual Conference 2018, President Xi announced four major measures China will take to further expand opening-up, signaling more opportunities for Hong Kong's future development. He hoped that Hong Kong would seize the opportunities to share its success stories with the world and facilitate China-UK "Golden Era". The Chinese Embassy will, as always, support HKSAR Government and Hong Kong Economic and Trade Office in London to expand the exchanges and cooperation with the UK. Secretary Chan said that Hong Kong attaches great importance to cooperation on health care with Britain to meet the population aging and other challenges. Looking into the future, Hong Kong, with the strong backing of the motherland, will give full play to its own strengths and seize the opportunities brought by the Belt and Road Initiative and the Guangdong-Hong Kong-Macao Big Bay Area to carry out cooperation with health care institutions in the Mainland. While developing itself, Hong Kong will contribute its part to the development of the motherland and the China-UK "Golden Era".